Will Cosmo DiNardo and Sean Kratz face death penalty? 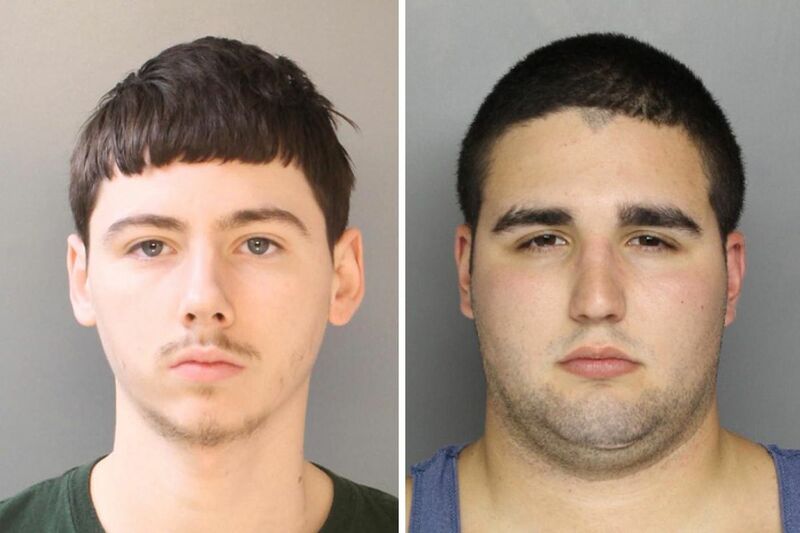 Sean Kratz (left) and Cosmo DiNardo (right) are charged in the Bucks County slayings. The two men are cousins. Two cousins accused of killing four young men in Bucks County are scheduled to appear in court for arraignments Thursday, a day after prosecutors reserved the right to seek the death penalty them. In court filings Wednesday — one day before Cosmo DiNardo and Sean Kratz are set to appear for arraignments on murder and other charges — prosecutors listed "aggravating circumstances" against both men. Proving those circumstances would be required for a death penalty case, but it is not certain that either man will face the death penalty. Prosecutors are still deciding whether to pursue a capital case against Kratz, First Assistant District Attorney Gregg Shore said Wednesday. For DiNardo, he said, prosecutors would seek the death penalty only if he backed out of an agreement to plead guilty to all four murders. DiNardo, 20, is charged with killing four young men — Jimi Patrick, Dean Finocchiaro, Thomas C. Meo, and Mark R. Sturgis — in July, after luring them to his parents' farm in Solebury to sell them drugs. Kratz, his 20-year-old cousin, is charged with participating in three of the murders; prosecutors say DiNardo killed Patrick on his own days earlier. The killings set off the largest investigation and search effort in recent Bucks County history and drew national attention to the quiet town of Solebury as investigators spent days searching for the four missing men. Bucks County District Attorney Matt Weintraub announced in July that DiNardo had confessed to the murders, told investigators where to find one of the young men's bodies, and identified Kratz as a co-conspirator in exchange for a promise that he would not face the death penalty. "Our office stands by our word," said First Assistant District Attorney Gregg Shore. "Should Mr. DiNardo follow through with his end of the agreement, which is to plead guilty to four homicides, we will stand by our end of the agreement, which is a sentence of four consecutive life sentences." Shore said he has no reason to believe that DiNardo will back out of that agreement, but prosecutors wanted to reserve their right to seek the death penalty if he changes his mind and asks to go to trial. Kratz was made no such promise, and Shore has declined to say since his preliminary hearing in September whether they would seek the death penalty against him. "We're not at a decision point with him," Shore said Wednesday. Wednesday's filings, however, leave the door open to capital charges against both men. Neither Kratz's lawyer nor DiNardo's immediately returned messages seeking comment Wednesday afternoon. The men are scheduled to appear for arraignments Thursday afternoon before Bucks County Judge Jeffrey L. Finley.